Andre Lorent sent me a a jar of their eye cream that boosts many benefits and is packed with some interesting ingredients. The most surprising to me was the Crazy Beautiful contains resveratrol which is found in the skin of red grape, peanuts and berries commonly included in weight loss products. Crazy Beautiful has a deliberate smell of being unscented. There is actually a scent for making a product smell like nothing and Crazy Beautiful definitely has that (whatever it is). It’s definitely not naturally unscented. It also has an off white coloring…almost a very pale pinkish tone. So the off color versus the white color in the ads can be off putting because you are expecting to open the jar and see a white smooth cream. Instead it looks homemade which is a plus on the ‘organic’ concept but not after you read the ingredients. Just to be clear, this product is definitely NOT Organic! 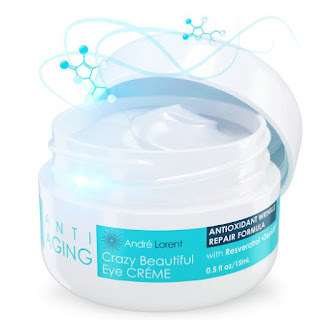 It also has the anti aging ingredient, Sepilift which is probably what most people a feeling when they say that the skin around the eyes gets really tight. Sepilifit gives the appearance of tightness and has been toted for its cellulite enhancements. Some of the ‘good’ ingredients are shea butter, aloe vera and jojoba oil. Overall, I’m not crazy about Crazy Beautiful but I’ve kept in my beauty kit for those just in case moments.